Avoid the endless stacks of files and unorganized paperwork from mounting on your desktop. Instead, create a desk that can efficiently store documents so that the space is neatly utilized and important information is readily available. Stylish, economical and spacious, the Modern Metallic Stand-Up Expanding Files maximize the amount of storage available on any flat surface by offering 13 pockets and 12 tabs to sort 8-1/2 x 11 size documents. 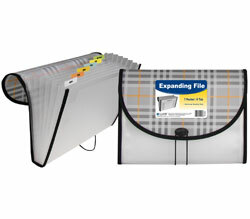 The expansive, accordion style file is made of extra durable, rigid polypropylene material. The exterior has a unique textured finish that adds a touch of flair to any office space. The file comes with pre-printed tab inserts that facilitate creating an alphabetical storage system. Vertical Orientation. Blackened Bronze. 1/EA.